Lampshade hats are not just for alcohol-induced escapades. In fact, small lampshades can be made into elegant Victorian-inspired feminine or top hats. Whether the creator is a cutting-edge fashionista or someone who needs a great Halloween costume, reusing an old lampshade is an inexpensive way to get a high-style look. With only a few materials and a lot of creativity, lampshade hat-making is a great family activity or fashion-inspired pastime. Adjust the compass so that it will equal the diameter of the brim. Place the needle of the compass gently on the cardboard sheet; be careful not to puncture the cardboard. While applying light pressure to the top of the compass, swing the pencil foot around so a perfect circle is drawn on the cardboard. The circle can be any size, depending on how large the brim is to be. Leave room on the cardboard for another circle. Place the small lampshade with the wide side down onto the cardboard. Trace around the edges of the lampshade with the pencil onto the cardboard. Place the small end of the lampshade in the center of the circle created for the brim of the hat. Trace around the lampshade with the pencil onto the cardboard. Cut the circles out with the scissors. Cut out the circle in the middle of the brim, using the utility knife. Keep on the inside of the line; the cutout center circle should be smaller than the traced line. Sand the edges of the circles for a smooth finish. Squeeze a line of glue around the wide end of the lampshade. Press the circle without the hole onto the wide end of the lampshade. This will be the top of the hat. Apply a line of glue around the small end of the lampshade. 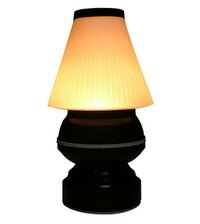 Turn the lampshade so that the top is facing toward you, then press it down onto the larger circle with the hole in it. Center the lampshade on the larger circle, positioning the smaller end on the edges of the small circle cut out earlier with the utility knife. Allow to dry. Paint the entire hat in the desired color. Two coats may be needed. Allow to dry, then apply decorations such as ribbons, glitter, felt pieces, feathers or flowers. These can be applied with glue. Measure a piece of elastic so that it fits around the underside to the top of your head. It should fit snugly, and in the same manner as a store-bought elastic headband. Fold one end of the elastic over the lampshade wire, which can be accessed through the brim’s hole. Sew the folded piece together and repeat for the opposite side. The hat can now be worn as a headband, with the elastic hidden underneath the hair. Use large lampshades to create oversized top hats for Halloween costumes. Pair the hat with gothic Victorian-inspired clothing, pancake makeup and dramatic hairstyles for a cyber-Victorian look. Do not be limited to circular brims. Brims can be cut into starbursts, ovals, squares and more. Just make sure that the center hole is circular.